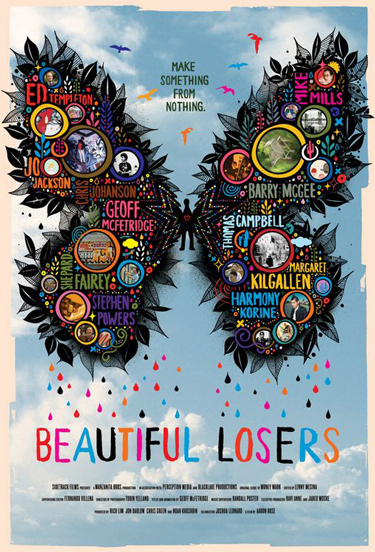 BEAUTIFUL LOSERS celebrates the spirit behind one of the most influential cultural moments of a generation. In the early 1990's a loose-knit group of like-minded outsiders found common ground at a little NYC storefront gallery. Rooted in the DIY (do-it-yourself) subcultures of skateboarding, surf, punk, hip-hop, and graffiti, they made art that reflected the lifestyles they led. Developing their craft with almost no influence from the "establishment" art world, this group, and the subcultures they sprang from, created a movement that transformed pop culture. Starring Shepard Fairey, OBEY founder and creator of the Barack Obama "Hope" poster; award-winning pro skater Ed Templeton; Harmony Korine, writer of the cult favorite KIDS and director of GUMMO and MISTER LONELY; and Mike Mills, director of THUMBSUCKER and designer of album covers for Beck, Beastie Boys, Sonic Youth, and more. Also starring Barry McGee, Chris Johanson, Geoff McFetridge, Jo Jackson, Margaret Kilgallen, Stephen Powers, and Thomas Campbell. Clips from Nationwide Beautiful Losers DIY Art Workshops and More. Sneaker Design with Jesse Leyva. Poster Art with Mike Mills. Editing Video with Lenny Mesina. Paint a Deck with Ed Templeton. Find Art with Jesse Spears. Make a Zine with Aaron Rose.